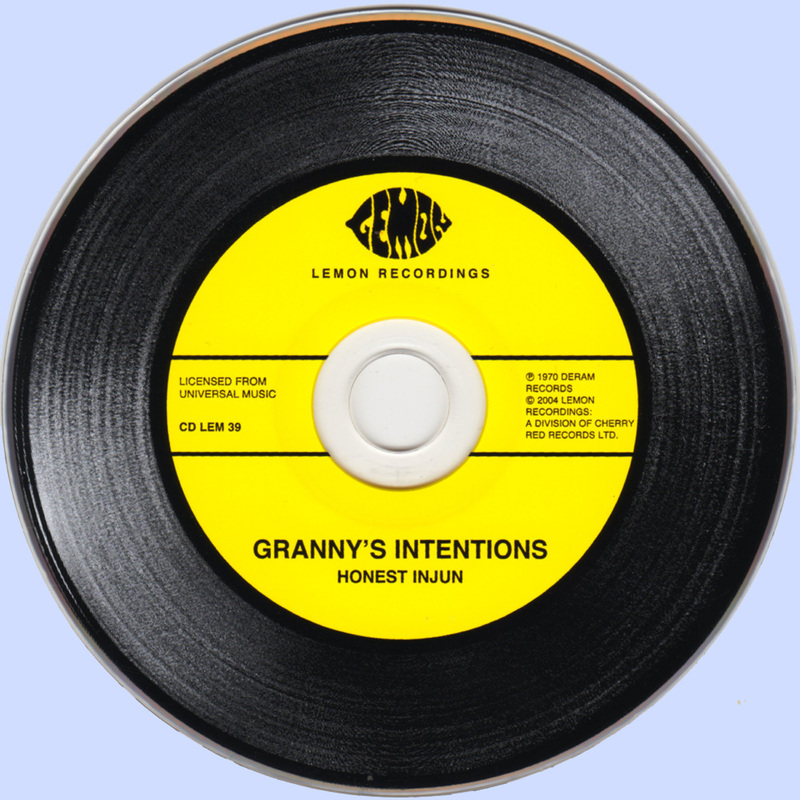 Both a period piece and a collectors' item, the release of “Honest Injun” by Granny's Intentions will no doubt be of immense interest to Gary Moore/Thin Lizzy fans. For such a well-chronicled musician, little information is available on Granny's Intentions, with whom Gary made his recording debut at the tender age of 17. Most biographies of Moore leap from his juncture in Skid Row with Phil Lynott in the late 60s directly to his joining Thin Lizzy in 1974, neglecting to mention Granny's Intentions. For close on 30 years copies of “Honest Injun” have been highly sought after, but its historical and musical context has been lost. Although the band hailed from Limerick, they were living in Dublin when Moore first met them. Formed in 1965, Granny's Intentions were popular on their home turf but had started to unravel when recording of the album commenced. Three tracks were cut in London with guitarist John Hockedy and former Skid Row drummer Noel Bridgeman before they split up. 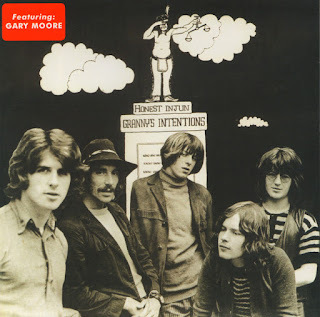 Back in Ireland, however, Granny's Intentions reformed and recruited Gary Moore with whom they completed the album at Decca Studios in London. The album was released on the Deram label in 1970, but despite its merits was already out of step with the prevailing trends. The band's moniker had misleading psychedelic nuance, whilst musically they were caught between the cusp of two eras; homespun earthiness melding with blues-orientated rock which would flourish in the 70s, although the flavour of “Honest Injun” is closer to Sherwood Forest than the Mississippi Delta. Throughout, Moore's playing is accomplished and flawless, his prowess belying his years, but what of the rest of the band? Already renowned for his ability as a budding songwriter, vocalist Johnny Duhan has a ballsy sincerity that fits the proscribed territory, songs for earnest travelling men, who spend their days 'telling tales of nights spent with right females', according to the lyrics anyway. Duhan later earned great acclaim for his compositions, and his material has since been covered by the likes of Christy Moore, The Irish Tenors, Mary Black, Van Morrison and The Dubliners. His best-known number, 'The Voyage', has become a standard. Drummer Noel Bridgeman is effortlessly appropriate, straight-forward where required, a little more complex when necessary, as on “I'm Going”, which led eventually to a guest appearance with Clannad. As of bass player and flautist Pete Cummins, guitarist Johnny Hockedy, horn player Zack Lawrence and Pat Nash who took care of the keyboard and drums, little is to be divined. This could be doing them a disservice, but since recording “Honest Injun”, they seem to have slipped off the map, at least in terms of rock history. Not even a trawl around the internet reveals any clues, although Pat Nash may have become a race driver in Idaho. One can only presume that producer Wayne Bickerton went on to a sweet future as a tunesmith, co-writing “Sugar Baby Love”, which was a hit for The Rubettes, and “Sugar Candy Kisses” for Mac and Katie Kissoon. But the fortunes of the band, aside from Moore and Johnny Duhan, who joined forces again in 1982, when Gary played on the singer's self-titled album, remain something of a mystery. Despite this, however, the music can now speak for itself, and provides a fascinating record of two influential artistes in the making.